England take on New Zealand on Saturday confident they can spring a surprise, but aware they face the ultimate test in modern rugby. The two teams have not met in four years, since when New Zealand have won 47 out of 53 Tests and retained their World Cup title. They also tied a series with a British and Irish Lions team in which England players occupied 19 of the 45 starting places across the three Tests, bolstered by their Wales and Ireland counterparts. Here, Press Association Sport analyses the task facing Eddie Jones’ side. The last meeting of England and New Zealand came at Twickenham on November 8, 2014, with the tourists winning 24-21 after second-half tries from Richie McCaw and Charlie Faumuina. They went on to sweep their autumn internationals while their 2015 World Cup win formed the early part of a winning run of 18 straight Tests – a world record, since matched by Jones’ England. Ireland ended that sequence in Chicago while Australia – twice in 12 meetings – South Africa and the Lions are the only other teams to beat New Zealand in the last four years, in addition to the Lions’ drawn series decider. New Zealand’s average result in that time is roughly a 38-17 win – a margin of three converted tries. Dig slightly deeper and New Zealand’s dominance becomes even more striking. Data analysis company Gracenote has studied the team’s fixtures since the 2015 World Cup, when facing one of the top nine teams in the world rankings – their fellow Rugby Championship sides Australia, South Africa and Argentina and the Six Nations teams other than Italy. The figures also include the three Lions Tests. In 40 games, New Zealand have averaged over five tries per match while no other country has even managed three. 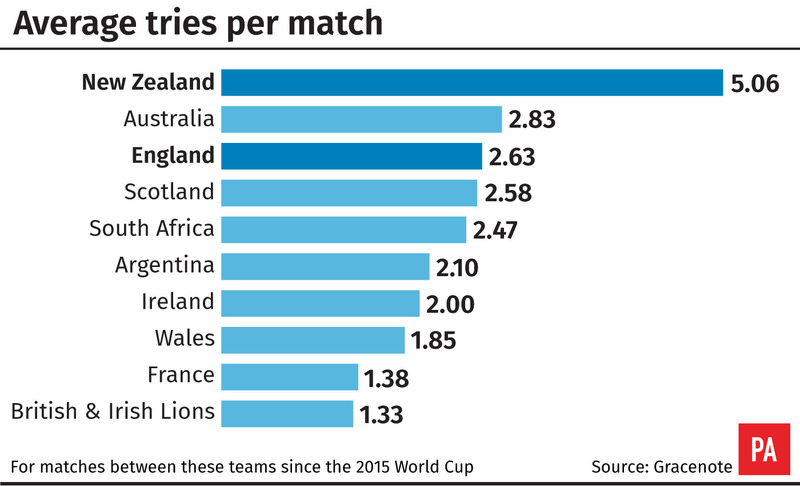 Australia rank second with 2.83 tries per match, with England third at 2.63. Steve Hansen’s side add an average of 3.75 conversions and 1.17 penalties per game – good for 11 points from the boot, ranked third behind England (12.82) and Ireland (11.32). The Kiwis rank sixth out of the nine teams in accuracy, landing 74.18 per cent of their conversions – well ahead of England, who despite leading the way in points kicked per game are last in accuracy at 70.42 per cent. New Zealand also enter their opponents’ 22 far more frequently than their opponents – 9.5 times per game in their 23 Tests since last summer, according to Gracenote. They have allowed just 6.2 visits per game to their own 22, meaning they have crossed that line 55 per cent more often than their opponents. England’s only hope may be to come out firing – the first six minutes of each half are the only times New Zealand have given up more 22 entries than they have managed. The All Blacks’ relatively low total of points from the boot is largely due to eschewing penalty attempts in favour of going for the line – their penalty attempts per game is comfortably the lowest of the nine teams – and the wisdom of that is borne out by their prolific try-scoring. They average 3.5 points every time they enter the opposition’s 22 – more than the three points a successful penalty is worth – and allow only 2.46 points per entry into their own 22.